C1455. 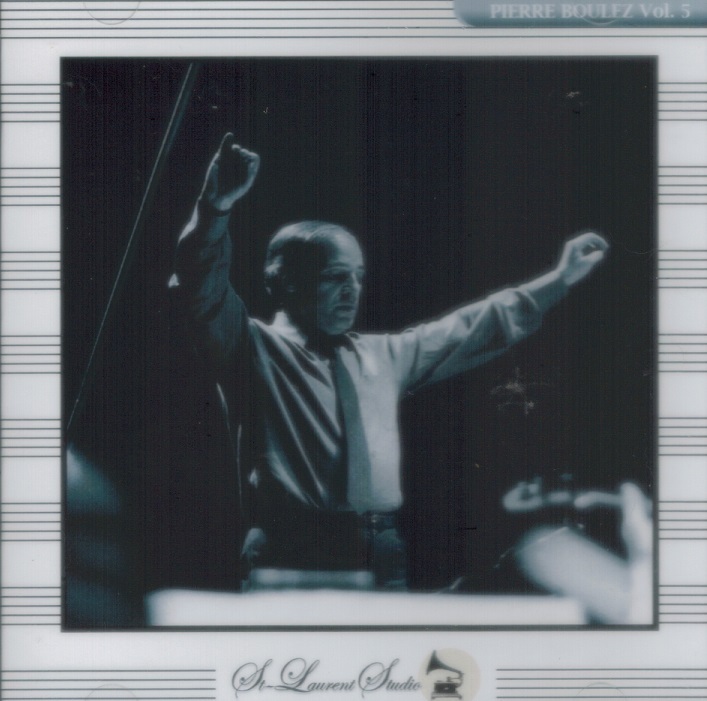 PIERRE BOULEZ Cond. Cleveland S.O. : Symphony #5 in B-flat; Symphony #6 in C (both Schubert). (Canada) St Laurent Studio YSL T-362, Live Performances, 12 March, 1970 & 19 Nov., 1967, both Severance Hall. Transfers by Yves St Laurent. “’Audacity, innovation, creativity — that is what Pierre Boulez was for French music, which he helped shine everywhere in the world’. Mr. Boulez belonged to an extraordinary generation of European composers who emerged in the postwar years while still in their 20s. They started a revolution in music, and Mr. Boulez was in the front ranks. But his influence was equally large on the podium. In time he began giving ever more attention to conducting, where his keen ear and rhythmic incisiveness could produce a startling clarity. (There are countless stories of him detecting faulty intonation, say, from the third oboe in a complex piece.) 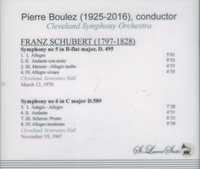 He reached his peak as a conductor in the 1960s, when he began to appear with some of the world’s great orchestras, like the Concertgebouw in Amsterdam, the Berlin Philharmonic and the Cleveland Orchestra. By the early ’70s, he had succeeded Leonard Bernstein as music director of the New York Philharmonic, an appointment that startled the music world and led to a fitful tenure. It was his reputation as an avant-garde composer and as a champion of new music that prompted his unexpected appointment in New York. 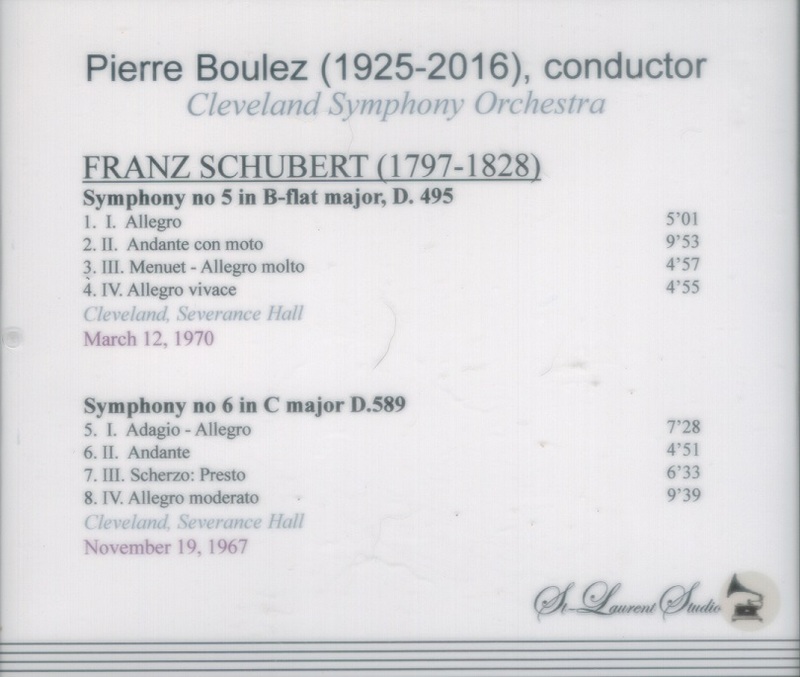 After the initial shock at his arrival, there was hope that he might bring the orchestra into the 20th century and appeal to younger audiences. But his programming often met with hostility in New York, and he left quietly six years later. ‘I had to learn about that music, to find out how it was made’, he once told OPERA NEWS. ‘It was a revelation - a music for our time, a language with unlimited possibilities. No other language was possible. It was the most radical revolution since Monteverdi. Suddenly, all our familiar notions were abolished. Music moved out of the world of Newton and into the world of Einstein’. To start on this route, he took lessons in 1945-46 with René Leibowitz, a Schönbergian who had settled in Paris. Soon he was integrating what had been separate paths of development in the music of the previous 40 years: Schönberg’s serialism, Stravinsky’s rhythmic innovations and Messiaen’s enlarged notion of mode. As Mr. Boulez saw it, all these composers had failed to pursue their most radical impulses, and it fell to a new generation - specifically, to him - to pick up the torch.